Is this what global warming looks like? 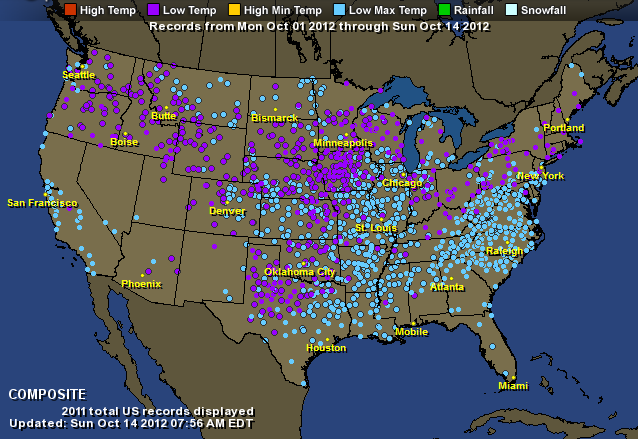 Over 2000 new low temperature records set in October | Watts Up With That? In the continental USA, there were 137 high temperature type records versus 857 low temperature type records this past week , a 6-1 difference. Last week there were 1154 low temperature type records putting the two week total for October at 2011. There were also 24 new snowfall records set this week in the upper plains. Once again, if this had been summer, and the numbers reversed, you’d see Seth Borenstein writing articles for AP telling us this is ‘what global warming looks like’. So far not a peep out of Seth on this cold wave and what it is supposed to mean. ← Tisdale: Where’s The Anthropogenic Global Warming Signal in the NODC Ocean Heat Content Data (0-700Meters)? No doubt the warmists will be telling us all that this is to be expected because of AGW. You can’t win! If it is cold it is because of AGW, if it is hot it is because of AGW. Sunny and showery day here in NE England, NE wind, temperature is 8 celsius at 14:00. All of course due to AGW. If AGW was a person he/she would be paranoid! WILD storms and unseasonal snow that have lashed southeastern Australia this week mask a bigger shift in the nation’s weather pattern – back to normal. The Bureau of Meteorology has downgraded its forecast for a possible El Nino weather system that would signal a return to the drier-than-normal conditions that wreaked havoc for much of the past decade. The weather pattern has been dramatic, but not particularly unusual. Ms (Senior bureau meteorologist Julie) Evans said the spring snow conditions were last recorded in 2008. “We do tend to get these cold outbreaks this time of year,” she said. The Bureau of Meteorology says snow falls have occurred right along the Great Dividing Range and as far north as Queensland’s Granite Belt. “I don’t think there’s been hugely heavy falls. [It’s been] fairly widespread,” he said. Does it now mean that we won’t be barbecued in our beds overnight but instead be turned into popsicles. I will now have to trade my new bathers and sunblock for thermal underwear. This is becoming expensive. If AGW was a person he/she would be paranoid! Bipolar might be the more appropriate term. Especially as Borenstein says nothing about the Antarctic, as well as ignoring record cold spells. A hard freeze like yesterday morning, Oct 13, is early even for this frost hollow. Any plant that is frost-sensitive was turned to blackish mush. AGW is old news. It is Climate Change that is the problem. Every fall human CO2 emissions cause the climate to change. In the Northern hemisphere is gets cold, in the southern hemisphere it gets hot. Every spring human CO2 causes it to change again in the reverse direction. This disrupts climate, thus it is called Climate Disruption. This process has been going on for as long as there have been humans on the planet, thus humans are the cause. We know this to be true because the US government has spent $100 billion paying scientists to say it is true. Yeah, Seth is busy writing about how AGW melts ice in the Arctic and increases ice in The Antarctic. And floes the size of Berlin (341 sq mi, ten times the size of Manhattan) are breaking off Antarctic glaciers. Turn out the lights. When a guy like this can continue to find an audience the communal intellect is nearly nil. Interesting how on the last map there are red dots surrounded by light blue ones. Is it because those stations have accuracy problems? It’s even been snowing recently in parts of ‘tropical’ Australia. If it were a heat wave you can bet your bottom Dollar it will pointed to as a sure sign of global warming. On a related note didn’t Michael Mann say something like the media would be highly irresponsible not to link the recent US heatwave to global warming? If so then where is Michael Mann now urging the media to report this record cold appearance as a ‘sign’ of global cooling, especially when you link it with the Met Offices release about the warming standstill? It’s just the weather and not the climate. I do wish Warmists would speak in the same way. We pick on warmers when they cite examples from small regions or short time periods as evidence for or against long term trends. Best not to do it ourselves, then. Of course it’s due to Global Warming. There’s nothing Global Warming can’t do. Ice melting in summer? Global Warming! Blizzards in winter? Global Warming! Tornadoes in spring? Global Warming! Hurricanes in summer? Global Warming! Christmas on December 25th? Global Warming! David Thomas Bronzich, great point. 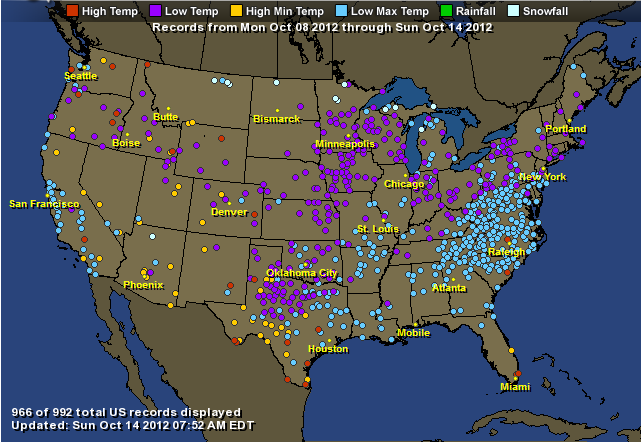 Like the one in North Carolina…there was a record high temp there, but nowhere else near it? Yet surrounded by a few states record low max temps? There is a cool bias in these maps in that when a station has both a high record and a low record, it is the low record that shows. My guess is that the records are printed in the left to right order of the legend. So that low temperatures overprint on the high records. It is easy to follow the link to see for yourself. If you do it now and click on only the highs, you see many High Min records in West Central Texas and the panhandle. Click on the Lows and many of those Texas High Min dots change to Low purples. Has anybody asked Seth his opinion? Correction to 8:03. It ultimately is a warm bias. Obviously the drawing order is not left to right in the legend. Lows are plotted after High Min. Highs are plotted after High Mins. (as can be seen today at Big Bend Texas). So it appears the points are plotted right to left in the legend. In which case the Highs will over print the all other points ( warm bias ), Low temps will over print all but the Highs. In the one today, there is a High on the central coast of South Carolina that overprints a Low Max Temp. Frankly, I think this is a bug. Over printing is the easy thing to do, but the proper thing is to use another color when two or more categories are seen at the same station, especially if it is a mix of cool and warm records. Frequently, cold snaps are preceded by strong southerly wind patterns, and in the South, this usually means warm moist Gulf air. These record lows, just lack the proper upward adjustments. interesting observation. for example, look up around Seattle. We have record highs and lows all overlapped within a week. there must have been a massive die off in plants and animals around Seattle, unable to cope with this extreme climate disruption. it must have made the st helen’s volcano look like child’s play. no doubt the area has been declared a national disaster, with emergency funding in the billions rolling in to care for the casualties. after all, the ipcc tells us just a 2C warming in climate will spell disaster for the world. imagine what a daily 10C shift at seattle has done. Oh, poor seattle. Raw temperature data, Anthony! Ve vill adjust zem, ja, und zen ve vill haff 857 new *high* temperatures, und 137 new *low* temperatures. And the original raw temperatures will be gone forevermore, ja. I really don’t think I should post this here but Climate Central has moved beyond ludicrous into the hysterical and Romm-like wholesale public deceit. The distance these deceiving buffoons go to prop up the narrative is behavior history will not look kind upon. Is this really the game you want to play, Anthony? In the continental USA, there were 1432 high temperature type records versus 121 low temperature type records ON MARCH 20,2012 , a 12-1 difference. 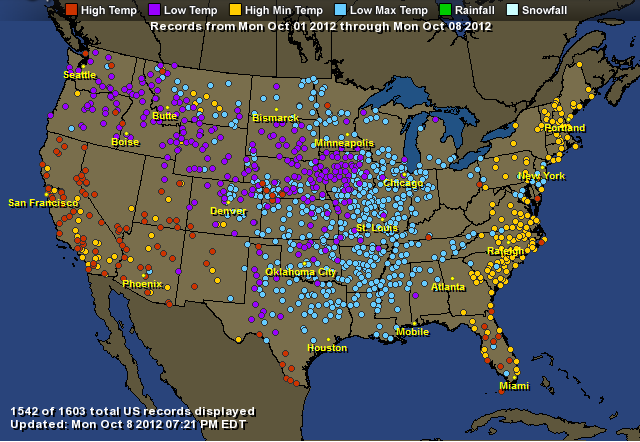 October has recorded just over 2,000 “low type records” for the first two weeks. Let me know if we get another 12,000 “low type records” this month. Yep, October would need around 6,000 “low type records” for each of the next couple weeks to match last March’s mark for “high type records”. Once again, this cold spell is way less intense than the warm spell in March, and probably less intense than many of the weekly warm spells throughout the year, but I don’t have time to do all that research for you. I do remember that June had ~ 3,000 record highs (and presumably about twice that number of “high type records”), so October is still well short of that number, too. So, YES! this IS what global warming would look like — occasional small small excursions below normal temps, with more frequent, larger excursions above normal temps. If you dig into those record high’s, particularly when they are surrounded by record lows, I have often spotted several incorrect reports. I remember a couple of years ago spotting a report of around 50F when no station around them exceeded 20F for the day. Out of curiosity, I know that temperatures are often “adjusted” when trying to determine regional or global temperatures (for various reasons with varying degrees of legitimacy). But are the actual daily records adjusted? For example, the “average” temperature of the US in the 1930’s has been adjusted downward, when calculated based on adjusted temperatures. But are the individual actual records adjusted? For example, if the record high somewhere was set in 1932 at 106 F, is that specific record changed (to say 104 F), so that a new temperature of 105 F recorded this year would now be the “record”? I suspect that the “record” would still be listed as 106 F in 1932, but I would be curious to know which way it actually works. Show us the global warming. Try to be consistent. This is not the same as this. Oh! Thankyou for that. Clearly, I have failed to keep up because – having read the most recent IPCC report – I thought global warming would look like this. In the graph the orange line represents the “committed” temp increase the IPCC said would occur after 2000 if there were no additional CO2. Clearly, actual temps from 2000 until now are lower than the projected “committed” warming while CO2 levels have continued to rise. But, of course, that projection was then, and it is now known that projection was plain wrong. You now say that projection is not what global warming would look like. This week you say global warming would look like flat-lining global temperature with “occasional small small excursions below normal temps, with more frequent, larger excursions above normal temps”. Are you willing to say what global warming would look like next week? Once again, if this had been summer, and the numbers reversed, you’d see Seth Borenstein writing articles for AP …. OK — here are numbers for July which ARE basically reversed (for 4 weeks, not just two) using the same source and methodology that Anthony used. hmmm … EVERY week in July was unusually hot in the the same way these past two weeks in October were unusually cool so we should be seeing articles every week. But Seth didn’t even bother writing about these — disproving Anthony’s hypothesis. After already writing one article about June, apparently records even more extreme than the one’s Anthony is hyping were not even worth a mention. So no, he did NOT write articles about similar weeks during the summer. Once again, when October sets records at a rate seen in March, April, May, June, or July (let alone setting similar records for months on end) THEN I would expect articles about the unusual nature of widespread cooling in the US. Yabut, it looks like 90% of the records are non-urban, therefore not subject to homogenization. I suspect these sites are not on the official Mann/Hansen list of qualifying sites. Where’s that Lazy Teenager and his Kamikaze comments? Come on Lazy…we need you to tell us how Warmists feel when 2000 individual low temperature records are broken. Still hasnt answered show us the global warming. depends on whether it’s cold or it’s hot. it’s cold all the time and never gets hot. it was cold yesterday and just now it got hot. but climate’s just weather whenever it’s not. I thought Christmas was a commercial holiday. Buy! Buy! Buy! No, there is no adjustment. That’s one reason why the number of high records keeps rising because urbanization and local site heating (concrete, etc) raise overnight mins creating new high min records. Urbanization also raises highs, but not as much as it raises lows. Perhaps a more accurate measurement would be to count the number of record anomalies if in fact accurate adjusmtents are made for these anomalies in respect to UHI. As Eric has stated with UHI being a huge factor it would be almost impossible to see more low records than high. Nah. That’s the modern term for “manic-depressive”. Not pertinent. All we’re seeing is the continued demonstration that no falsification of AGW is acknowledged, permitted, or offered. There’s more. Every working day, the CO2 emissions from industry make the atmosphere more transparent, making it look lighter. Then after 5pm it all stops, CO2 falls and the sky darkens. Before there were humans, there was no artificial pollutant-artefact of “night and day” – just an unending Edenic twilight. Kurtosis is the key factor. 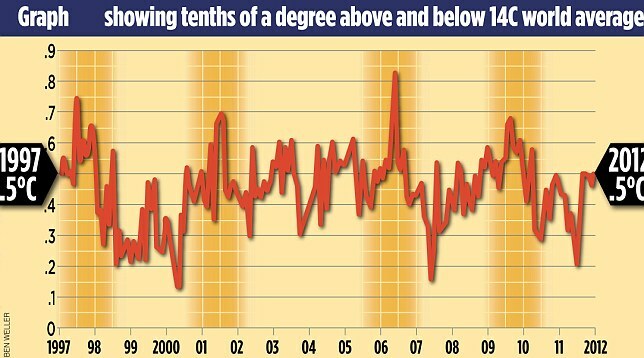 AGW predicts that as varience increases with a temperature increase there WILL be more high AND low records set. It is what is meant by increasing extremes in the weather record because of climate change. It requires a particularly naive grasp of climate science to view a bout of extreme clod weather as a refutation of AGW when it is precisely the opposite. Well, D, thanks for your response to my post, which listed stats pointing to the fundamental silliness of the original post and its basis for a discussion thread, generally. You’ll note that that post was “disappeared”. Great site. izen, what exactly is “varience” and how does AGW increase “varience”? Varience is the same as variance for those who do not obsess about spelling trivia that has no effect on the meaning. AGW increases varience because as the average temperature increases the distribution of the magnitude of events widens, the effect of changing kurtosis. Your cherry-picking of selected weather events is a lame attempt to get around the null hypothesis, which has never been falsified. izen, thanks for spelling kurtosis correctly. Please be specific as to what you are claiming. When you claim that AGW widens the distribution of the “magnitude of events”, what is the event and what is the magnitude? Are you saying the distribution of temperatures for any station widens? Or the distribution of all temperatures for all stations? I doubt the latter is true, the former might be true for some stations but not others. This post highlights the MANY stations that have set both high and low records this year. I would doubt that all stations show this, but it is clear that most do. It seems odd that a site that has been rejecting the finding of more extreme weather as a result of AGW in post after post this summer should identify and publicise the clear evidence of the increasing records set by the widening varience. Which null hypothesis is that ? The null hypothesis that the rising CO2 has no effect on the change in climate has been comprehensively refuted by direct observation of the changes in the energy spectra of the outgoing and downwelling LWR, The continuing increase in ocean heat content and the exceptional nature of the recent century long trend in temperatures and ice melt. It is not I who cherry-picked these records, they are being hyped by this thread. Just as the summer records were being minimised by this site. If you look at the formula then you will see the expected variance depends on the sample size. And each day the sample size of “weather” events increases because an additional day’s measurements are obtained. Therefore, you need to provide data for variance if you want to show it is changing in a manner that it is “widening” with time. Secondly, an increased number of observed “extreme” weather events can be expected with passage of time. Weather data has not been obtained for long: a few places (e.g. CET and Armagh) have been recording weather data for centuries but generally only for about a century. On the first day of measurements then each measurement was a record. As time passed the frequency of newly achieved records would have reduced. 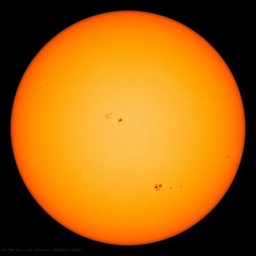 But new records would still be observed. Now, thousands of places obtain measurements of temperature, precipitation and wind speed each day. It would be very, very surprising if any day, any month or any year did not provide a record weather datum somewhere. Your assertion of “clear evidence of the increasing records set by the widening variance” is a falsehood. And your armwaving is not sufficient replacement for the data of changing variance which you have failed to provide in support of your assertion. Thirdly, the expected observation of additional record weather values is not – as you assert – a “finding of more extreme weather as a result of AGW”. It is merely the result of continuing to obtain additional weather data in many places. However, if global temperature is increasing then the rate of obtaining new record high temperatures should be increasing while the rate of obtaining new record low temperatures should be decreasing. And there is no evidence of that: perhaps you can provide some? O dear! Such appalling ignorance. There is only one null hypothesis. The feedbacks in the climate system are negative and, therefore, any effect of increased CO2 will be probably too small to discern. This concurs with the empirically determined values of low climate sensitivity empirically obtained by Idso, by Lindzen&Choi, etc.. Therefore, the man-made global warming from man’s emissions of greenhouse gases (GHG) could be much smaller than natural fluctuations in global temperature so it would be physically impossible to detect the man-made global warming. Indeed, because climate sensitivity is less than 1 deg.C for a doubling of CO2 equivalent, it is physically impossible for the man-made global warming to be large enough to be detected (just as the global warming from UHI is too small to be detected). If something exists but is too small to be detected then it only has an abstract existence; it does not have a discernible existence that has effects (observation of the effects would be its detection). You seem to be claiming that the rate of hot and cold extremes or records is entirely in line with statistical predictions for a system in which the mean and the spread are unchanging. Like two dice the average remains 6.5 and the number of double sixes and double ones are continuing to appear at the expected frequency of 1:32. If so your argument is less with me than with the author of this thread article who clearly is claiming some significance or exceptionalism for the cold records as a means of offsetting the exceptional run of hot records so far this year. The prediction from climate science is that BOTH the number of high and low records will increase, the effect of changing kurtosis. In terms of the dice analogy the mean increases, but the number of double sixes AND double ones also increases. These observations rather put paid to your silly claim that to date there are no observable effects of AGW. As does the massive loss of Arctic ice over the last few decades. As desperate excuses go, your post at October 16, 2012 at 7:21 am deserves a prize. You claimed the variance of weather data was increasing. I explained why you needed to provide variance data to show that. I said that if global temperature is rising then extreme record highs should be occurring more frequently than extreme record lows. You posted to links to two extremely unreliable sources. The RC source refers to data from Hansen for the period 1931-1980 when everybody agrees temperature was rising, and it confirms what I said. The other is from an anonymous twerp who posts under the alias of Tamino and whose post disputes Hansen’s assertions. And you think that refutes what I said or shows there has been no warming over the last 16 years!!? I fell off my chair laughing at that! Well, if that were true then the increase to Antarctic ice which provided the recent record Antarctic ice would be evidence that AGW does not exist. Even by your poor standards, your post I am answering is pathetic. Surely such a limited snapshot of the weather in one region of the world has no place in a debate centered around global climate change? You are right to criticize any scientist who equates high temperature over a short period to global warming, especially without further analysis on the synoptic conditions at the time but then you go on to just that by given a hugely biased picture of local temperature over an extremely short time frame and claim it as a victory for skepticism. This entire article seems a tad hypocritical. The climate change debate should be concerned with critical analysis of trends, not snapshots!